I’m sure most of you have heard and are aware of the millions of people around the world that lack access to clean water. SODIS is a simple procedure for disinfecting drinking water. 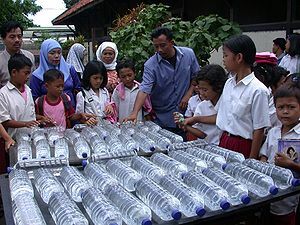 Contaminated water is poured into transparent water bottles (glass or plastic) and placed in the sun for six hours. During this time, the UV rays of the sun kill all the germs. Does anyone else feel that we’ve been wasting a lot of time and money building solar panel powered water purification plants? All this time we could have harnessed the sun’s rays directly. This is a great, simple, and inexpensive solution that should have been put into place YEARS ago. Thumbs up to the SODIS program for running with this.